Welcome to St. Margaret Mary Parish! The parish had its beginnings on Sunday, May 4, 1932, when Bishop Paul Rhode announced the establishment of the first Catholic parish in Neenah. With their first pastor, Rev. 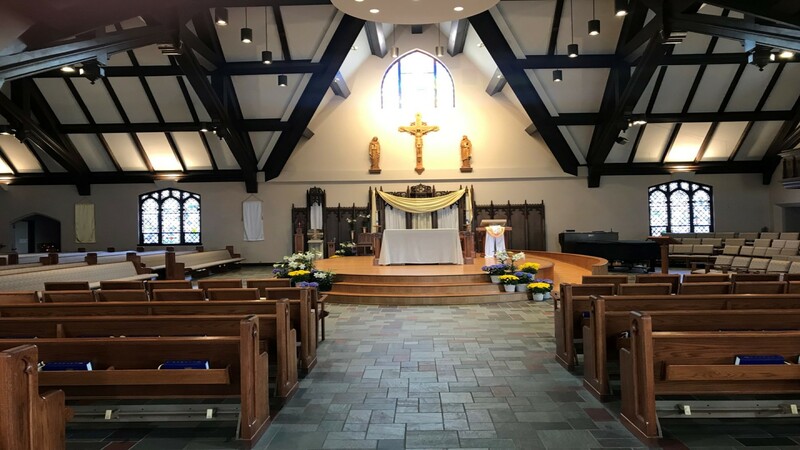 Joseph Van Bogart, the new parish community of 250 families celebrated Mass at St. Patrick Parish, Menasha, while they planned and constructed St. Margaret Mary Church. On September 12, 1932, just four months after the announcement establishing our parish, the groundbreaking ceremony was held. Construction was started on October 17, 1932, and continued throughout the winter. On Easter Sunday, April 16, 1933, the first Mass was said in the lower level (Friendship Hall) of our church building. About two months later, on Trinity Sunday, June 11, 1933, the cornerstone was laid and Bishop Rhode solemnly dedicated our church. The three bells in the church tower were donated by the family of the first pastor, Rev. Van Bogart. They were rung during the dedication ceremony but not from our bell tower! They were awaiting installation so they were rung where they sat on the lawn of the church grounds. Next time you hear them ring, say a prayer of thanksgiving to our God who has blessed our parish community in so may ways throughout our history. We are grateful to our founding members for their vision and sacrifice in building our church and for all who gather here to worship our God. WHO IS SAINT MARGARET MARY? Daughter of Claude Alacoque and Philiberte Lamyn, Margaret was born on July 22, 1647 at L'Hautecour, Burgundy, France. She was sent to the Poor Clares School at Charolles on the death of her father, a notary, when she was eight years old. She was bedridden for five years with rheumatic fever until she was fifteen and early developed a devotion to the Blessed Sacrament. She refused marriage, and in 1671, she entered the Visitation convent at Paray-le-Monial and was professed the next year. From the time she was twenty, she experienced visions of Christ, and on December 27, 1673 she began a series of revelations that were to continue over the next year and a half. In them Christ informed her that she was His chosen instrument to spread devotion to His Sacred Heart, instructed her in a devotion that was to become known as the Nine Fridays and the Holy Hour, and asked that the feast of the Sacred Heart be established. Rebuffed by her superior, Mother de Saumaise, in her efforts to follow the instruction she had received in the visions, she eventually won her over but was unable to convince a group of theologians of the validity of her apparitions, nor was she any more successful with many of the members of her community. She received the support of Blessed Claude La Collombiere, the community's confessor for a time, who declared that the visions were genuine. In 1683, opposition in the community ended when Mother Melin was elected Superior and name Margaret Mary her assistant. 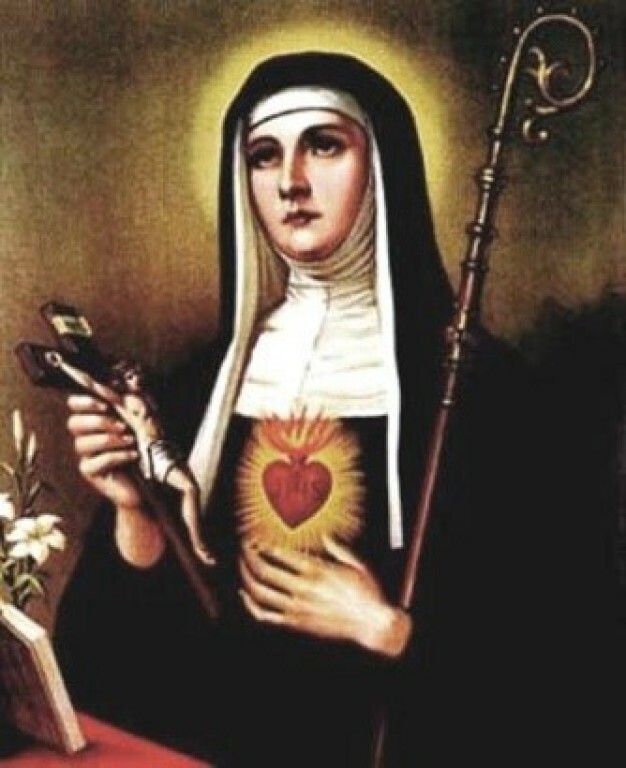 She later became Novice Mistress, saw the convent observe the feast of the Sacred Heart privately beginning in 1686, and two years later, a chapel was built at the Paray-le-Monial to honor the Sacred Heart. Soon the observation of the feast of the Sacred Heart spread to other Visitation convents. Margaret Mary died at the Paray-le-Monial on October 17, 1690 and was canonized on 1920. Her feast day is observed on October 16.